Chris has been interviewed for his Smart city expertise in a key report on urban mobility. 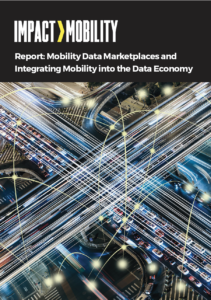 “Mobility Data Marketplaces and Integrating Mobility into the Data Economy”, features interviews with leading mobility thinkers. The report has been released in the run-up to Impact>Mobility, Europes first Mobility Data Summit, Amsterdam, 24th-25th June. Focus on a range of outcomes a place wants to achieve related to mobility, such as air quality, average speed through an urban centre or number of minutes in congestion – Chris Cooper. The report looks at how data sharing can benefit ticketing, insurance and journey planning. It also looks at the role city legislators must play and how adopting standards leads to better outcomes. Other contributors include Hyundai, Continental and SharedStreets. We should be generating open data that puts citizen first and lets them choose using three criteria: cost, time and comfort. – Chris Cooper. You can read the full report here (free, registration required). The report was published by @cities_impact and written by @susankuchinskas. If you would like to take advantage of KnowNow Information’s Smart City expertise then contact Chris via chris.cooper@kn-i.com or on 07967 275469.